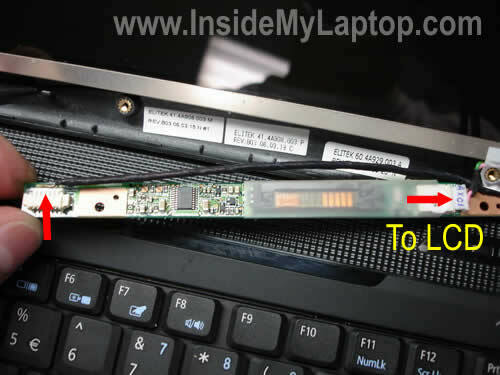 You’ll find four rubber plugs in four corners of the LCD screen bezel. 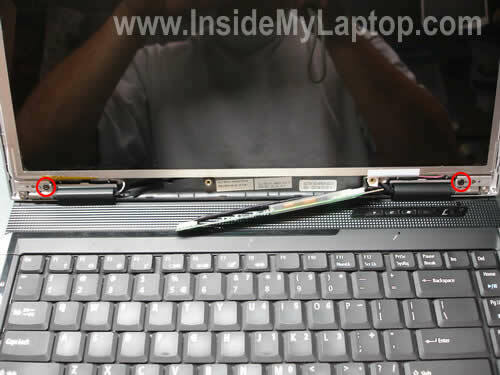 Remove these plugs with a sharp object and glue them somewhere on the bezel so they don’t get lost. Remove four screws hidden under the rubber plugs. Start separating the screen bezel with your fingers. I found it’s easier to separate the bezel if you start from the top. Continue separating the bezel. 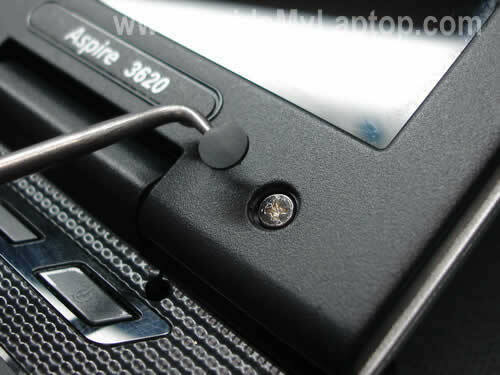 Be careful with the display latch, it has to stay attached to the screen cover. 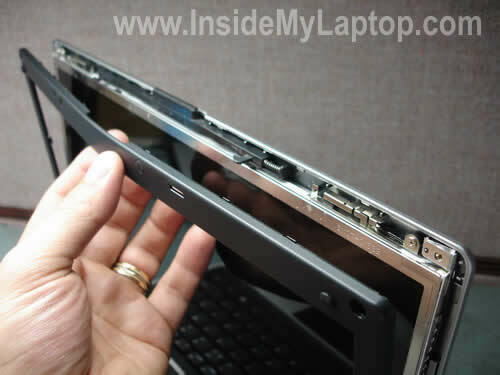 Finally, remove the LCD screen bezel. 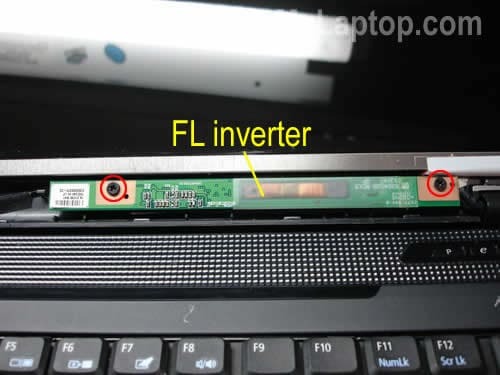 You’ll find the screen inverter board also known as FL inverter mounted below the LCD screen. Remove two screws securing the inverter board. In order to remove the inverter board, you’ll have to unplug two cables. The black cable on the left side is connected to the motherboard. It supplyis power to the inverter board from the motherboard. The cable one the righ side is connected to the backlight lamp inside the LCD screen. Now you can replace the inverter board with a new one if needed. I’m not going to remove the LCD screen because I’m taking it apart just for this guide. Remove two screws securing the LCD screen brackets to the hinges. 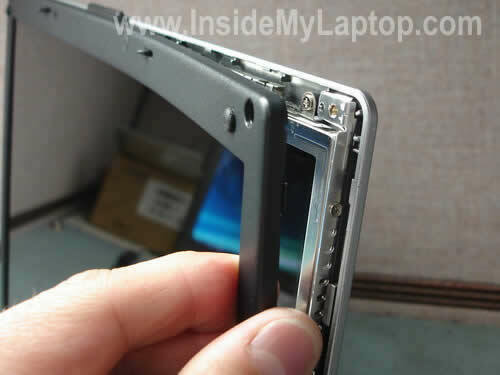 Now you can separate the LCD screen assembly from the cover and access the back side of the screen. 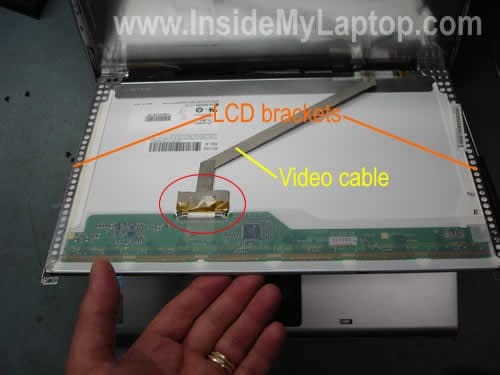 In order to remove the LCD screen assembly you’ll have to unplug the video cable first. 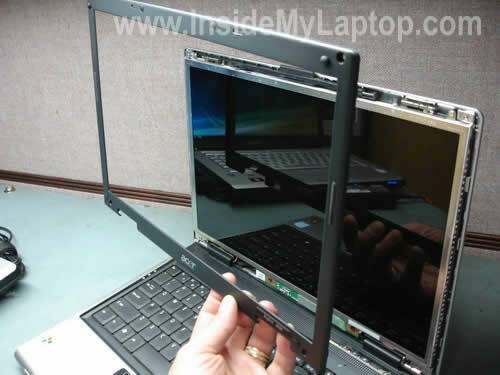 After the video cable is unplugged, you can remove the LCD screen assembly (screen and mounting brackets).